Buying a home that needs some TLC can be a good choice. Imperfect homes come with less competition from other buyers, and you can build tens of thousands of dollars in additional equity in a short time by making relatively minor improvements. But there’s a reason not as many people want to buy a fixer. It does take more work, planning, and time compared to buying your standard “turn-key” home. Up for the challenge? Then rewards await. Here are your first steps. The Process: From applying to walking into your newly remodeled home, the steps you take to get it done. Eligibility: What you can do with a 203k rehab loan, and what you can’t. Pros and cons: Incredible benefits, and some downsides, too. An FHA 203k loan, (sometimes called a Rehab Loan or FHA Construction loan) allows you to finance not one, but two major items 1) the house itself, and; 2) needed/wanted repairs. Because the lender tracks and verifies repairs, it is willing to approve a loan on a home it wouldn’t otherwise consider. The loan addresses a common problem when buying a fixer home: lenders often don’t approve loans for homes in need of major repairs. A home must meet certain safety and livability standards. Some home buyers are handy enough to buy the house and fix it up themselves. But, if the home is too run down, you can’t get a loan in the first place. The 203k lets you buy and fix up a house in one transaction, allowing the lender to approve the loan despite its initial condition. Receiving a final approval involves lining up contractors and receiving bids, and some additional “hoops” to jump through. Don’t get stressed at this process, though. The 203k lender will drive the process and guide you through. You’re not on your own! Choose your projects: The first step is deciding which repairs you want to do (see “What Kind of Repairs Can I Do?” below). The lender will require any safety or health hazards to be addressed first – things like mold, broken windows, lead-based paint, and missing handrails. From there, choose which cosmetic items you want to take care of. For instance, say you want to replace appliances, add granite in the kitchen, and gut the bathroom. Those are all acceptable projects for the loan. Choose your contractors: Once you’ve got your project list together, find contractors. The contractors must be licensed and insured, and typically have to be in full-time business. You can’t use buddies who do construction on the side, and you typically can’t do the work yourself unless you’re a contractor by profession. Best results will come from super-experienced and professional remodeling firms that have done at least one 203k renovation in the past. Remember: your entire project can be held up by one contractor that is unwilling to complete the necessary forms. You might even go so far as to write the 203k paperwork requirements into the contractor agreement. Get your bids: Once your contractor is “on board” with helping you complete your loan, get official bids. Make sure the bids aren’t “guesses.” They must be completely accurate. The reason is that the lender will submit final bids to the appraiser, who builds the value of the work into the future value of the property, upon which your loan is based. Changing bid dollar amounts later could incur additional appraisal costs and trigger re-approval with the lender. Again, make sure your contractor knows all this! Close the loan: You will sign final documents, and the house is officially yours. The contractor starts work: Once the loan is finalized, the contractors can start the work. Depending on the extent of the repairs, you may be able to move in at the same time. For bigger projects, arrange to live somewhere else until work is complete. You can finance up to six months of payments into your loan amount to allow room in your budget to do so. Move In And Enjoy: The work is complete, and you’re the owner of a beautiful new home. You’ve probably built a ton of equity in a short time, and you didn’t have to engage in a bidding war to buy your ideal home. Not every mortgage lender originates 203(k) loans, and not every loan officer or mortgage broker understands the product. So you’ll want to make sure that the company you work with is approved to do this loan and does a lot of them. HUD has a helpful search page you can use to determine if the lender you want to use has done at least one 203(k) rehab loan in the last 12 months. You just type in the lender name at the top, scroll down and check the box for 203(k) rehabilitation mortgage insurance program. A 203k is a sub-type of the popular FHA loan, which is built from the ground up to help those who might not otherwise qualify for a mortgage. 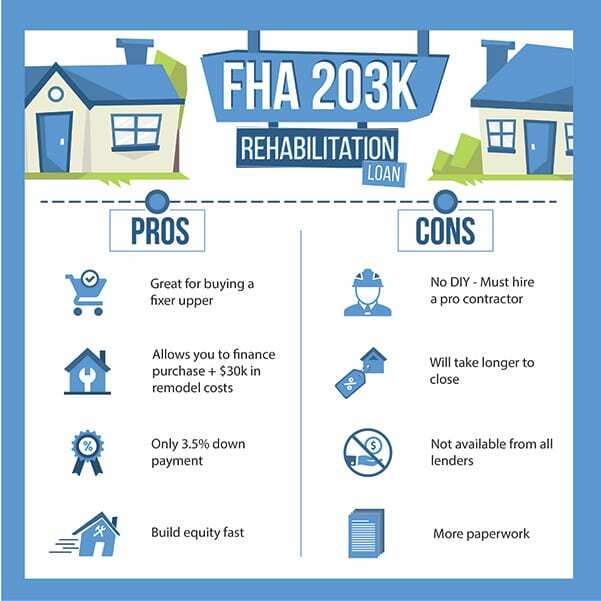 FHA’s flexibility makes 203k qualification drastically easier than for a typical construction loan. FICO: FHA allows credit scores down to 580, although some lenders might require a score of 620-640 to qualify for a 203k. Still, that’s much lower than the 720+ you would probably need for a conventional construction loan. You can receive 100 percent of your down payment requirement via a gift from family or approved non-profit organization. Debt Payments and Income: Lenders will examine your debt-to-income ratio. This is the comparison of your income and debt payments. Typically, less than 43 percent of your income should go toward your proposed house payment plus all other debts. That’s $430 in payments per $1,000 of before-tax income. For example, if your income is $5,000 per month, your future house payment plus auto loan payments, student loan payments, and credit card bills shouldn’t exceed $2,150 per month. Loan amount: You can borrow up to 110 percent of the property’s proposed future value, or the home price plus repair costs, whichever is less. These loans are also subject to your region’s FHA loan limits. Occupancy: You must plan to live in the property you are buying. If you plan to fix and flip, the 203k loan isn’t for you. Citizenship: All FHA loans are available to U.S. citizens and lawful permanent residents. Lenders will verify citizenship status at time of application. What repairs can I do? There are two types of 203k loans. Which one you choose depends on the extent of the repair work. This option allows you to do relatively minor repair work. Things like kitchens and bathrooms. The stated limit to costs is $35,000. However, an FHA 203k loan requires a “buffer” equal to 15 percent of the total bids. This buffer is called a contingency. It’s a “just in case” fund to cover cost overruns by your contractor. (If the contingency fund is not used, it is credited back to you). So, your “real” maximum repair job can cost around $31,000. In short, you can’t do anything structural (move load-bearing walls, add rooms) or change the footprint of the home. So why choose the Limited 203k option? Because more lenders offer it than the full 203k. And, it’s a much simpler process than the standard option. With this option, you can do just about anything you want to the home, except non-permanent changes or adding luxury amenities. Read More → Should You Choose A Standard Or Limited 203k? There are several reasons that the FHA 203(k) might not be your best option. You may only need a few thousand dollars for minor work. Your renovation might be too luxurious or pricy for FHA guidelines. You might want to do the work yourself. Or you’d prefer a loan that doesn’t require mortgage insurance for life. In that case, there are other loans, and at least one might be a better fit. Home equity loan: Also called a second mortgage, these usually fixed-rate mortgages have higher interest rates, but cost less to originate and don’t require mortgage insurance. They are great for projects requiring a large sum upfront. The catch is that you need some home equity now, before you improve the property, because second mortgage lenders typically lend up to 90 percent of the as-is property value. HELOC: the home equity line of credit is a good option when you need flexibility or don’t need to borrow a lot at once. It usually has a variable interest rate, and you pay interest on the amounts you draw out. You can repay and re-use it up to your limit. Setup costs are low-to-none. Like the second mortgage, you need some existing home equity to get a HELOC. Fannie Mae’s HomeStyle® mortgage allows you to buy and rehab a home with just 5 percent down. It does not require a 1.75 percent upfront mortgage insurance premium like FHA does. And if your credit is good, your monthly mortgage insurance is cheaper as well. Finally, you get to cancel mortgage insurance once you have 22 percent home equity. Mortgage rates are somewhat higher for FHA 203k loans. Expect to receive a rate about 0.75 percent to 1.00 percent higher than for a standard FHA loan. Still, base FHA rates are some of the lowest on the market, so 203k rates are competitive. You’ll pay standard FHA mortgage insurance, which is typically 1.75 percent of the full loan amount upfront (rolled into the loan) and 0.85 percent yearly (broken into 12 equal monthly payments). On a $250,000 loan, that’s $4,375 upfront and $177 per month. Here are the steps you’ll complete when buying a fixer-upper with an FHA 203k loan. It’s a little different from a “regular” loan, because you’ll be submitting your list of improvements, and the loan doesn’t completely fund until the improvements are complete. Find a lender approved to do 203k loans. Get several mortgage quotes so you can be confident that you’re getting a good deal. Apply for your home loan and get a pre-approval letter. Find a property. Make sure that your offer contains language indicating that you need a 203k loan in order to complete the purchase. Note that your maximum loan amount calculation is different for purchases. Check out HUD’s Maximum Mortgage Worksheet for more information. Find an FHA 203(k) consultant, if your improvement costs will exceed approximately $31,000. This person will arrange for a detailed proposal from licensed contractors. It will contain the scope of the work to be done and a detailed cost estimate. Find a contractor to write an estimate of work needed and materials required. You aren’t allowed to do the work yourself unless you are a professional builder. The lender, after giving you the okay, will get your home appraised (with and without improvements). When the loan closes and funds, the seller gets paid. The rest of the money from your lender goes into your escrow account. The lender (or its agent) releases escrowed funds to the contractor as work is completed. Once your contractor completes the work, you own a renovated house that may already be worth more than you paid for it. That’s a sound investment as well as a home customized to your needs. Most people use this loan to buy a home, but it can be used to refinance, too. If you have owned the property for less than one year, the lender must use acquisition cost plus the documented rehabilitation costs for your maximum loan amount. You do not need an FHA currently to use an FHA 203k refinance. The buy-and-rehab strategy can give home buyers instant equity, and a lot of it. Homes in need of repair or updating can be had on the cheap, and the fixes may not be very expensive at all. For instance, a house potentially worth $250,000 may sell for just two hundred thousand, when it needs only twenty thousand dollars in repairs. That leaves $30,000 in potential equity for a buyer with the initiative and drive to manage the fixes. According to real estate data website Realtytrac, the median home price in a “distressed” sale was 42 percent lower than the price netted in non-distressed situations. That’s a big discount. The problem comes, however, when the buyer goes to finance the home purchase. Most mortgage programs require homes to be in near-top shape before the loan is approved. That’s where the FHA 203k rehab loan comes in. The Federal Housing Administration’s (FHA) 203k loan allows buyers to finance the home and up to $35,000 in repairs with one loan. It’s possible to have lower payments and higher equity in your home the moment you move in, compared to your friends and neighbors. It’s time to take a closer look at the FHA 203k program. As you would expect, there are some plusses and minuses with the loan. The benefits are undeniable: gain a ton of instant equity, deal with less competition to buy the home, and gain valuable experience remodeling a home. But with every reward comes the preliminary work. The 203k loan is no exception. As stated above, you will have to secure reputable contractors, and be uber-diligent about having them complete paperwork. Don’t be surprised if the lender requires you to send a bid back to the contractor two or three times for missing information. You will also have to decide on the upgrades that are within your budget. That can be exciting, but also stressful. You’ll have to make decisions quickly to ensure the loan approval stays on track. The loan process will take more time than a standard loan. You are increasing paperwork requirements by 2-3 times compared to a standard loan. Go into the process expecting and embracing that fact. Don’t think that you’ll be the exception that closes the loan in fifteen days. Set realistic expectations with the seller! Are you ready to tackle these relatively minor inconveniences to reap the benefits? Then a 203k loan is probably the right loan for you. It’s always wise to shop around and find the best lender. This is a rare exception where you might take a higher rate from a lender that does these all the time, rather than a low rate from an inexperienced lender. In the world of 203k loans, contractors and lender experience is typically more of a consideration than cost. Complete a short form at this link, and check your eligibility for a 203k loan from a lender in our network. You’ll receive a rate quote, eligibility check, and further advice on whether the loan is right for you. 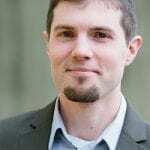 The following are real-life success stories of 203k loan users, with reporting by Lee Nelson, who has appeared on Realtor.com, MyMortgageInsider.com, and more. In his early 20s, a young college graduate working at a bank came to Elizabeth Larsen’s loan office to talk about buying a home. The three-bedroom property in Aurora, Ill, that the buyer chose had some issues, including two bathrooms that needed updating and an unfinished basement. One year after he took out the rehab loan, the new homeowner came back to Larsen. Because his home had increased in value, he wanted to refinance to a conventional loan. This buyer had put plenty of time and effort shopping around to get the right remodelers. The good work they did helped him make money from his renovation. Often, you can gain instant equity by remodeling — if you choose projects that add more home value than they cost. “He also wanted a total debt consolidation and put his student loans into the refinance,” Larsen added. Realtor Alexa Rosario works almost exclusively with first-time homebuyers. “I just closed on an FHA 203(k) loan recently, and absolutely love the program for a few reasons,” says Rosario, agent with Happy Homes Network of Keller Williams Realty in Plantation, Fla. The restrictive guidelines placed on homeowners associations by most lenders make it hard to finance condos in Florida. And there is a lot of competition from investors for lower-priced single-family homes and townhouses. But her recent clients, a newlywed couple who had recently graduated from college, were able to go under contract for a bargain $130,000 townhouse that needed a lot of work, said Rosario. “We had a contractor go out and give us an estimate for the repairs. The repairs were going to cost about $40,000. I knew that there were similar, updated properties that were selling for $180,000, so I was confident that we could make it work,” she says. The rehab loan went through for $170,000, and the buyers put 3.5 percent down. The appraisal, closing and repairs loan went without a hitch.